Idle Planet Miner is the latest game title from the publishers of Idle Apocalypse game. Similar to their previous titles, Idle Planet Miner also features a unique game system. In the game, the player discovers, upgrade, manage the planets in the galaxy. At each planet, you will mine the resources. You can sell these resources for the money, invest in the projects, make something new by crafting, smelting. As you upgrade the planets, discover new ones, unlock the new projects, colonize the planets, unlock or build new smelters/crafters, the value of galaxy will increase. Once you reach the 10 million value, you will be able to sell it for the precious credits. You use these credits to build rooms in the mothership. Let’s head to the Idle Planet Miner guide and Idle Planet Miner tips, cheats & strategies! level 17) is 6.20/second. And, the ship is mining Silica in 3.72/second, Copper in 2.48/second. Tap the (i) symbol near the mining rate stat to get more details. 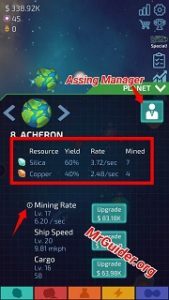 ⇒You can improve the mining rate, ship speed, and cargo stats by upgrading the planets or assigning the managers. ⇒Tap on a planet and tap the avatar icon at the top-right side of the planet pop-up -> recruit or assign. By default, you have only two slots. So you can assign up to two managers. To increase the maximum number of assigned managers, you will have to buy manager slots. After tapping the avatar icon, tap the + icon next to slots -> purchase. ⇒You can also improve the manager stats by promoting. Tap the manager -> tap the ⇑ button -> select the same grade managers -> promote. Keep in mind that the manager used in the promoting process will disappear. The three main in-game currencies are idle money/cash, dark matter, and the credits. You can earn idle money/cash by selling the resources, dark matter by completing the achievements/tasks/rovers mission/watching the video ads, credits by selling the galaxy. Selling the resources -> Tap the mothership or the first tab at the bottom of the screen -> select a resource/ore which you want to sell -> use the seek bar to adjust the quantity -> hit the sell button. Similarly, you can sell alloys, items. Rovers Mission -> Head to the third tab; projects, there you will find the rover project. Research it to unlock the ability helps you in scanning planets for valuable items. Once researched, tap the tank option on the top-right side -> start the scan. You can earn dark matter by scanning the planets. Credits -> At the top-right corner, tap the graph/stats icon -> here you can check the galaxy value. Reach the 10 million to sell the galaxy for the credits. Tap the last tab(mothership) at the bottom menu -> sell galaxy -> sell. You will get the credits, but the game will start from the beginning. You will keep the dark matter, credits. After it, head to the mothership tab again -> new room -> select one and construct. There is a project in the lab menu that you can research to colonize the planets. Once researched, you will see a mushroom type icon above the planet. Tap it and check the colonization requirement. You can claim a bonus(mining rate, ship speed, cargo) by colonizing the planets. The player mines a variety of ores from the planets. You can use the ore for further item production. For example; you can smelt the copper ore to get the copper bar, lead to lead bar, and the recipe list goes on. After smelting the ores, you can use the output in crafting items. For example; to craft the battery, you need copper wire, copper bar. Tap the 2nd tab(production) at the bottom menu -> here you have two options; smelting and crafting. Tap the smelt button -> choose a recipe. Spend idle money or cash to discover a new recipe. Tap the X to stop the smelting. Tap the craft button -> recipe -> choose a recipe. The production process is also automatic. All you need to do is select a recipe and the resources will go in the production zone automatically. Build more smelters and crafters to smelt/craft multiple products at the same time. So that’s all for now as Idle Planet Miner guide for the rookies. Let’s check out our top Idle Planet Miner tips, cheats & strategies! You should sell the resources at the right time. The market value of these resources changes every certain amount of time. If there is a dip in the price, you will see a red color down arrow next to the ore. And, if there is a rise in the value, you will see a green color up arrow next to the ore. You can keep track of the current market in the demand & supply graph. On the right side of the screen, tap the market graph icon(just below the tasks). There you can see the changes in the market and the next change time. Every now and then, an infinity stone appears on the screen. Tap it to collect the free resources/ores. Head to the 4th tab(boosts) and activate the first mine boost by watching the video ad. This booster will increase the mining rate for all the planets for 1 hour. Building rooms in the mothership activate permanent boosts. There are a number of rooms available to construct; engineering, forge, workshop, lab, lounge, packaging, backup generator, and more. To build and upgrade, you need credits. Sell the galaxy at the right time – depending on the next room construction cost or room upgrade cost(to get more credits, increase the galaxy value). If you are still struggling to figure out what to do, then pay attention to the tasks and complete them for dark matter. Or set your own goal; for example; sell ores -> save Idle money and build smelters/crafters, store ores -> research projects, speed up the progress – upgrade the planets. Keep upgrading, researching, building, crafting and increase the galaxy value. Sell the galaxy -> earn credits -> construct new rooms in the mothership. 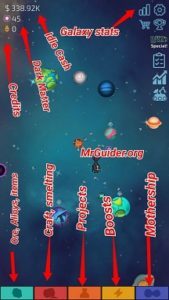 So these are the top basic Idle Planet Miner tips and the Idle Planet Miner guide for the beginners. If you have more tips to share with other fellow players, comment below! Previous Post:Utopia: Origin – How To Tame Red Horse? does anyone know how to colonize the other planets after the 4th planet? Same here, I can’t colonize rest planets except the first 4 planets. There is a room that can increase the offline earnings length. But that’s very far in progress. Does anyone know what is meant by 25 beacon tokes a day if you buy the $9.99 no ads purchase? Anyone have a 6* manager? Is it worth trading 3 other 5* manager?